The Opel Insignia (shown) shares its architecture with the next Buick LaCrosse. General Motors says it will maintain deep product-development ties with Opel/Vauxhall despite a plan to sell a stake in the subsidiary. Austrian-Canadian supplier Magna International is leading a Russian-backed consortium that will own 55 percent of Opel/Vauxhall. GM will remain integrated with Opel, the German unit it has owned for 80 years. "Any deal in Europe will include GM holding a significant stake in the new entity," said GM spokesman Chris Preuss. "Any concept that has been looked at about realigning the Opel assets has always concluded that they would stay aligned pretty tightly to the GM product development network. "For this entire generation of products, plus the next coming generation, things are pretty intertwined," he said. Opel, of Ruesselsheim, Germany, has developed two global front-drive vehicle architectures. A compact architecture went into production this year, and a mid-sized architecture was launched last year. The compact architecture covers a wide range of global models, including low-priced cars in South America, medium-priced cars for Opel in Europe and several compact vehicles that are on the way in the United States. The U.S. vehicles include the 2011 Chevrolet Cruze and Chevrolet Volt and the 2012 Chevy Orlando. When development started, it was expected that by 2012, GM would produce 1.2 million units globally each year off the platform. 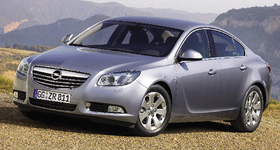 The mid-sized architecture is used for the Opel Insignia, the Buick LaCrosse due this fall, the redesigned Chevrolet Impala and several other models. This architecture was originally expected to generate global volume of nearly 1 million units by 2013. Magna is a partner with Russian bank Sberbank Rossii on the Opel bid. Under the arrangement, Sberbank would take 35 percent of the company, Magna would get 20 percent, Opel's employees would get 10 percent and GM would keep 35 percent.